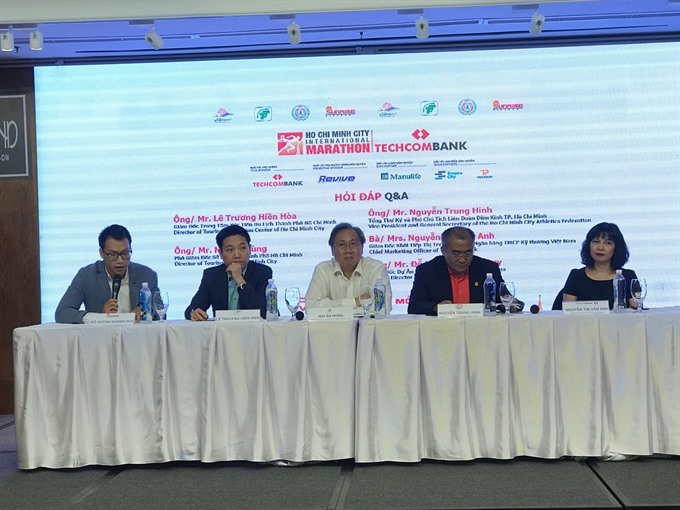 HCM CITY — More than 8,200 foreign and Vietnamese runners are expected to participate in the 2018 Techcombank HCM City International Marathon to be held in HCM City on December 2. More than 6,500 athletes from 38 countries and territories have registered so far. The athletes will compete in four races: a full marathon at 42.195km, a half-marathon at 21.1km, a 10km race, and a 5km race. The races will go through six districts, with the starting point at Thảo Cầm Viên (Zoological and Botanical Garden) and the finishing line on Nguyễn Cơ Thạch Street in District 2. A Kids Run for children will be held in the afternoon of December 1 in the Thủ Thiêm new urban area, with the aim of getting kids involved in running and a healthy lifestyle. Speaking at a press briefing in HCM City on November 1, Lê Trương Hiền Hòa, director of the HCM City Tourism Promotion Centre under the city’s Department of Tourism, said the tournament would encourage sports and physical training and contribute to improving health and living standards. The event aims to build healthy lifestyles and cultural environments in residential areas, and popularise the city’s images abroad. The event is co-organised by the HCM City departments of Tourism; Culture and Sports; the city’s Athletics Federation; Sunrise Events Việt Nam and Techcombank. The organisers will donate VNĐ10,000 for every one kilometre run at this year’s event to the HCM City Fund for the Poor and Promotion Fund for Young Talents of HCM City. Last year, the event raised over VNĐ600 million (US$25,734) for the charity.